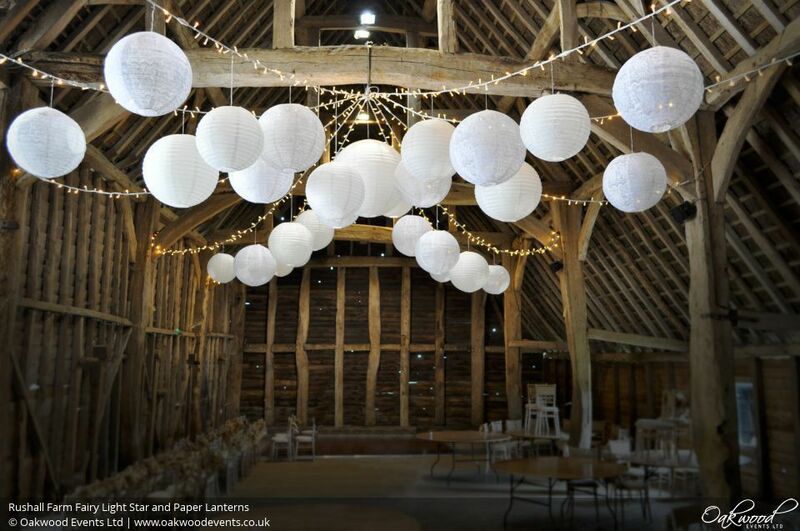 Here's our fairy light star canopy with lace and paper lanterns for a wedding in the Black Barn at Rushall Farm. The fairy lights were suspended from a central point, radiating out to the pillars around the barn to create a 10-point star canopy. 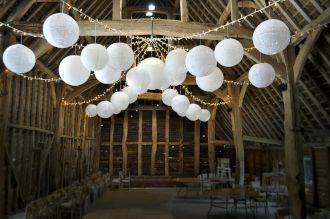 A mixture of white paper and white lace lanterns were hung onto the lights, transforming the barn with this beautiful display. As well as fairy lights and paper lanterns, the structure of the Black Barn makes it perfect for lots of our other services such as chandeliers, festoon lights, drapes and LED uplighting. Contact us here to discuss lighting ideas for your wedding at Rushall Farm. We just wanted to say thank you so much for the lighting in the barn - it was absolutely perfect and the barn just looked incredible!! We had the most amazing day and would love to do it all again! !